- Provides cost-effective selectable or concurrent dual-radio Wireless-N connectivity for high capacity and additional users. - Gigabit Ethernet LAN interfaces with PoE enable flexible installation. 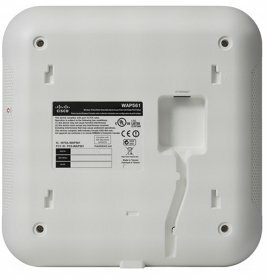 - SmartSignal Antenna technology optimizes wireless coverage and reception. - Captive portal enables highly secure guest access with customized roles and rights. - Single Point Setup requires no controller, for easy cost-effective deployment of multiple access points. - Works right out of the box with easy installation and simple web-based configuration and wizard. In today's dynamic business environment, employees are becoming more mobile and collaborative than ever. To stay productive, they need dependable, business-class access to network applications throughout the office. 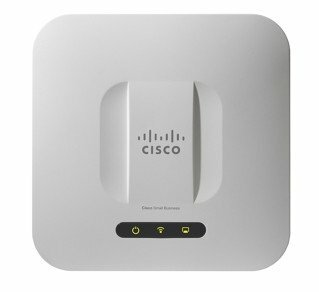 The Cisco Small Business 500 Series Wireless Access Points provide a simple, cost-effective way to extend secure, high-performance mobile networking to your employees and guests, so they can stay connected anywhere in the office. This flexible solution lets you connect dozens of employees, and can scale to accommodate additional users and changing business needs. To enhance reliability and safeguard sensitive business information, the Cisco 500 Series access points support both Wi-Fi Protected Access (WPA) Personal and Enterprise, encoding all your wireless transmissions with powerful encryption. In addition, 802.1X RADIUS authentication helps keep unauthorized users out. Designed to scale smoothly as your organization grows, the access points feature controllerless Single Point Setup that simplifies the deployment of multiple access points without additional hardware. With the Cisco 500 Series access points, you can extend business-class wireless networking to employees and guests anywhere in the office, with the flexibility to meet new business needs for years to come.